The Lollipop Hand Held Drum will provide hours of enjoyment! The Remo Colorful Lollipop graphic has huge appeal for children. 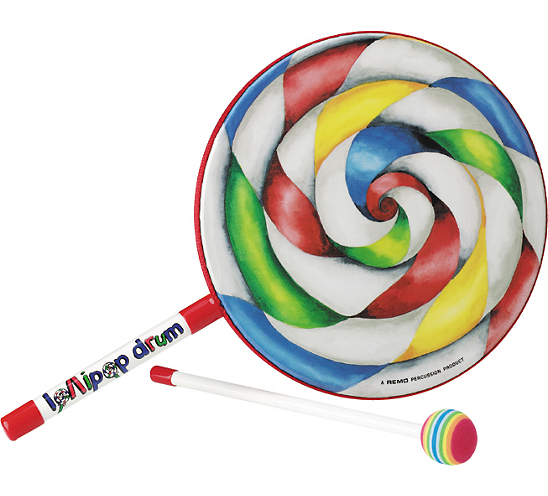 Kids love the lollipop design and the easy-hold design let's them tap out a rhythm easily It has a small handle and is light weight to make it easy to play for even small children. The LolliPop Drum is an easy-to-hold "drum on a stick" which is an ancient idea, found in Africa and Japan. Ours is made by Remo just for kids. Includes beaters. These adorable hand-held drums are perfect for kids of all ages to be loud and make sound while practicing hand-eye coordination. Easy for little hands to hold.